For the past few weeks we’ve been talking justice, how it is central to our understanding of who God is and what God is like, and what that means for us as fans and followers of Jesus. We’re doing this to remind us of who we are and of what our place in the world is. We’re called to be people who not only nourish the world, but who shape it and guide it, moving it closer and closer to that kind of world God wants us to have. So we talk about justice because justice is what we’re supposed to be talking about. It’s what we’re supposed to be concerned about. a justice that heals, restores and makes right. and today we talk about why the church should care about immigration and refugees. and a hebrew word which should blow our minds. So why refugees and immigration in church? Out of all the things we could talk about, why this one? It’s in the news so we need to know how to process what we’re seeing. We’ve sponsored a refugee family and we should know why we did that. 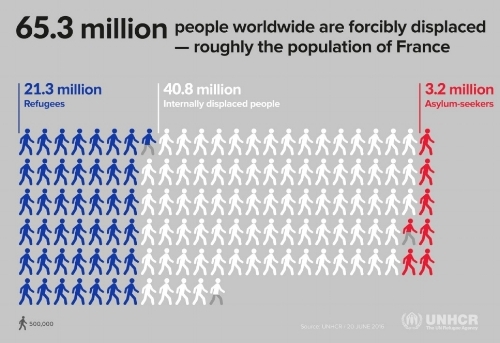 There were 65 million people fleeing their homes in 2017. That’s 1 in 113 people on our planet. 51% of those are children. All of them forced to move because of violence, famine, poverty, and persecution. We’re talking about this because this is the world we live in. This is the reality of millions of our brothers and sisters around the world. And as people who live in Canada, a country who actively receives immigrants and refugees, this is an important conversation we’re having as a society. And the question for us this morning is how do we, as people of faith and spirituality, as people trying to see and understand the world and our place within it in a very particular way, have that conversation? What’s the spiritual perspective do we need to have on this? So that’s the question we’re asking this morning: how do we, as people of faith, come at this conversation? Now, we could come at this a few ways. We could explore how Jesus, the very person at the centre of our faith and spirituality, was himself a refugee. We could talk about how we have a God who comes to us from beyond. We could explore how God has this habit of entering into our lives and world from the people and places we so often write off and dismiss as worthless and strange. But for today, let’s come at it another way. Let’s enter into it all through this small, innocuous, four letter Hebrew word that blew the minds of some ancient rabbis. And that word is found right at the beginning of our Bibles in the second chapter of Genesis. it’s the story of how and why God made the universe. Its the story of how after making the world and everything in it, God took some dirt, breathed into it, and created humanity, inviting them to join in on what She was doing, asking them to help steward the world towards a world where everyone had a place and everyone had enough. We know it as the name given to the first human God created, that archetype and representative of all of humanity. Adam is actually the Hebrew word ‘a-dam,’ and a-dam means ‘earth.’ Which isn’t too mind blowing really. The guy is named after the stuff he’s made of. To be human is to be of the earth. To be human is to be able to be at home anywhere in our world. That’s pretty beautiful isn’t it? There’s some power in there. It’s to be at home anywhere in the world. That should blow our minds! And we could just stay here and riff around with that for a bit and see how it helps us answer our question, but let’s play with this some more and see if this understanding of what it means to be human can help us understand that other story we heard this morning. And that’s beautiful news. We have a God who listens! We have a God who responds to our cries! We have a God who breaks the chains of the things that oppress us! We have a God who leads us out of death and into new life! The land God is going to lead them into? It’s not empty. It’s already occupied by six other peoples. That land God is leading them into is already home to other people. Is God endorsing colonization and invasion? Is God advocating for the violent take over of other people and nations? We need to ask them because that’s exactly what goes down: Israel enters in and things get pretty bloody. We need to ask them because this is the text people have used to justify things like residential schools, colonization, genocide, and war. And so we need to rumble with those questions. They are really important questions to ask. But there’s one more question we need to ask and it’s the question that we need to ask when trying to figure out how we navigate the conversation of immigration and refugees. While God is saying this to Israel, what’s God saying to the Canaanites, Hittites, Amorite, Perizzites, Hivites, and the Jebusites? What is God saying to the people in the land the Israelites are about to enter into? What is God saying to those who are about to encounter the thousands upon thousands of people fleeing oppression, persecution, and slavery in Egypt? We need to ask that question because isn’t that our question? Aren’t we looking for guidance on what to do with the thousands of people looking to flee violence, persecution, and death? Aren’t we asking how do we see these people moving towards us looking for a new home? But why would God be saying that to them? How can we think that’s what God would say? Its the word our tradition uses to talk about how in order to make room for the universe to exist, God first had to remove a part of God’s self, God had to shrink into Herself in order to make space for new life to happen. We have a God who makes room. We have a God who makes space for new life to happen. We have a God who sacrifices Godself for the sake of the other. God tells them to make some room because that’s how its supposed to work. Thats the example we’re to follow. As people created in God’s image we practice zimzum. When space is needed for new life to exist, we make room. And maybe that’s where we find the way to have this conversation about immigration and refugees. and we make that space because we know we are all Adam. We are all of the earth. We are all at home in this world. “I have heard the cries of the children in Syria. I have felt the pain of the LGBTQ community in Uganda. I have seen the people struggling to cross the Mediterranean. I am leading them out of oppression and violence and bringing them here, to your country, your city, and your neighbourhoods.